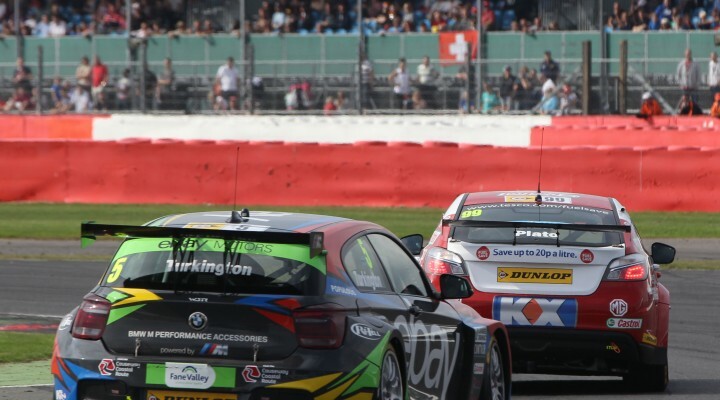 MG KX Clubcard Fuel Save driver Jason Plato has won the opening BTCC race at Silverstone after getting the better of championship leader Colin Turkington in an early tussle. Mat Jackson completed the podium in his Airwaves Racing Ford Focus having jumped fellow second row starter Sam Tordoff off the line. It was Turkington’s BMW 125i M Sport that led into Copse for the first time after the eBay Motors star had immediately blasted by Plato’s pole-sitting MG6 as the lights went out. Despite the front runners producing close fought racing for the remainder of the contest there were no further changes to the top order. The same couldn’t be said further down the field as seventh changed hands on several occasions with eBay Motors’ Rob Collard eventually coming out on top. His final manoeuvre was by Quantel Bifold Racing’s Marc Hynes but Collard’s penultimate pass on the Audi A4 of Rob Collard was particularly eye-catching. Pirtek Racing’s Andrew Jordan rounded out the top ten. There were feisty scraps throughout the chasing pack with Tom Ingram, Gordon Shedden, Jack Clarke, Matt Neal and Fabrizio Giovanardi seemingly swapping paint and positions at will. Honda Yuasa Racing’s Shedden and Speedworks Motorsport’s Tom Ingram made contact on two separate occasions, with the latter’s race eventually ending in the gravel after running wide at Copse.